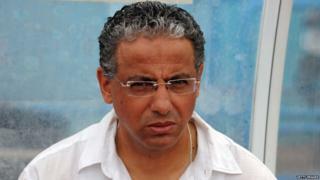 Libya national football team head coach Adel Amrouche don do u-turn afta im claim say Nigeria Super Eagles dey use juju to play ball. Amrouche tok say im wan say sorry to di Nigeria football community afta for press conference for South Africa wia im say Nigeria Super Eagles and juju na 5 and 6. Amroruche say na joke im just dey joke, say im get respect for Nigerians but im don see say na bad joke. For di Saturday press conference im do afta di Tuaregs of Libya team draw 0-0 wit Bafana Bafana wey dey same group wit Nigeria for di 2019 AFCON qualifier, Amrouche tok im mind about how im feel about di Super Eages wen dem ask am about im plans for di two kontri battle next month. Amrouche tok say: ''Believe me, I go prefer to play Nigeria instead of Bafana Bafana (South Africa)''. ''I no say una dey believe in juju too much and as for us, na God we dey believe,'' na so Amrouche tok. Amrouche bin vex Nigerians wen dis im juju tok reach internet dat Saturday. Pipo don chook dia mouth enta dis kwanta for Twitter. Nigeria and Libya go enta one trouser for di 1st leg of di two kontri AFCON qualifier on October 10 for Kaduna, north central Nigeria.